Members of the Party for Socialism and Liberation [which is a member of the ANSWER Coalition] carried signs reading, “We Stand With Turkey! Erdogan Out!” as we marched north on Michigan Avenue from the Tribune Tower to Water Tower Place and back. 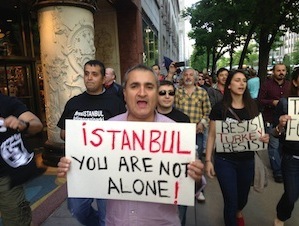 Progressives, activists and members of Chicago’s Turkish community stand in solidarity with those demonstrating in Taksim Gezi Park, in Istanbul, and all over Turkey and will continue to do so as the Turkish people fight Erdogan, his reactionary Justice and Development Party and the brutality of the police forces.